Despite their humble origins as plain carbon, cousin to soot and graphite, diamonds are the hardest substance known to humankind. This makes them invaluable for a variety of applications, from drilling in rock to providing the best polishing powder possible. It seems sheer luck that diamonds also possess an extraordinary crystalline structure that, when cut and polished, can outshine the beauty of any other gem. Diamonds have been known since ancient times, especially in India, where the first diamond industry flourished; India was the exclusive source of diamonds from about 900 BC to 1725, when they were discovered in Brazil. Initially, diamonds were most prized in their natural eight-sided shapes, due to Indian taboos against cutting them into gem-shapes. But by the 1300s, diamonds were imported into Europe, where the taboos against cutting them quickly went the way of the dodo. Diamonds soon became the gems-of-choice for those who could afford them; the first recorded diamond engagement ring was presented by Archduke Maximillian of Hamburg to Mary of Burgundy in 1477. 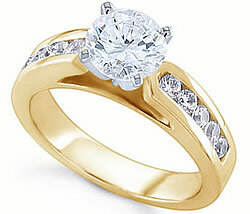 Besides their hardness and sparkle, diamonds have long been valued for their rarity. Diamonds are formed hundreds of miles underground in zones of great heat and pressure, and are brought to the surface in volcanic "pipes" made of a rock called kimberlite. Not all kimberlites contain diamonds; however, those in South Africa and Siberia do, and have spawned a thriving diamond industry in both regions. Russian mines in Siberia, which are owned by a company called Alrosa, produce almost $3 billion worth of diamonds a year -- 20 percent of the world's total. Diamonds can also be found in the southeastern United States, Canada, and Brazil, but less often in commercial quantities. Central and southern Africa share the world's highest concentration of diamonds, and it is those regions that have become the world's diamond-mining centers. The rich volcanic history of that part of the world has resulted in the creation of huge numbers of kimberlite pipes, most of which produce diamonds. Diamonds are often mined from water-deposited sediments, where erosion has placed them, and African sources currently yield the majority of the 30 million carats (13,000 pounds) of gem-quality diamonds produced each year. Another 100 million carats (44,000 pounds) of bort, or industrial-quality diamonds, are produced annually by the entire industry. Most bort is used for drilling, or is ground into powder for polishing. Nearly all gem-quality diamonds are funneled through diamond trading centers such as London, New York, and especially Antwerp, Belgium. Since 1888, over half of the world's diamonds have been controlled by a single company, De Beers, which is based in Johannesburg, South Africa and London. Synthetic diamonds have been available since the 1950s, but are most often used for polishing, drilling, cutting, and grinding. Currently, about 400 million carats (88 tons) of synthetic diamonds are produced yearly for these purposes. There is some hope that synthetic diamonds may also find use as semiconductors and even computer chips. Until recently, synthetic diamonds were not viable as gemstones; however, recent processes using very high heat and pressures have produced striking colored gemstones, which may soon rival natural diamonds in quality and, especially, price.